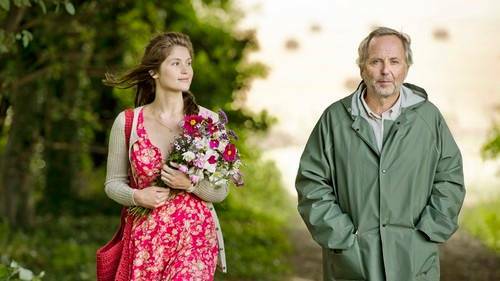 Gemma Arterton and Fabrice Luchini in Gemma Bovery. Gemma Arterton stars in Gemma Bovery, a new movie opening this weekend in Vancouver. In the film, Arterton stars as the title character, a woman whose name is definitely destiny, at least in this case. Inspired by Gustave Flaubert’s 1856 classic novel, but based on Posy Simmonds’ 1999 graphic novel, it features a bread-making former academic, Martin (Fabrice Luchini), who becomes convinced that his new English neighbour, the stunning Gemma Bovery, is destined to repeat the fate of the tragic heroine of Flaubert’s novel. Gemma Bovery is actually the second movie to be based on a Posy Simmonds comic, and starring Arterton. The first, Tamara Drewe, was released in 2010 and directed by Stephen Frears. Gemma Bovery also stars Jason Flemyng, as Gemma’s husband Charles, and Niels Schneider as Gemma’s aristocratic lover; Mel Raido as her ex-lover; and Isabelle Candelier as Martin’s long-suffering wife. Set in Normandy, Gemma Bovery offers gorgeous scenery, the lovely Arterton and a smart, funny script (by director Anne Fontaine, with Pascal Bonitzer). The film is in French and some English and Franglais with English subtitles. This entry was posted in Features, news and previews and tagged Gemma Arterton, Gemma Bovery, graphic novels, Posy Simmonds. Bookmark the permalink.